A main goal of the remodel for architect Andrew Carson was to update the home with modern amenities while maintaining its architectural integrity. One such example is this curved wall, which he added to create a minimal division between the dining and living rooms; it looks and feels like an original element. 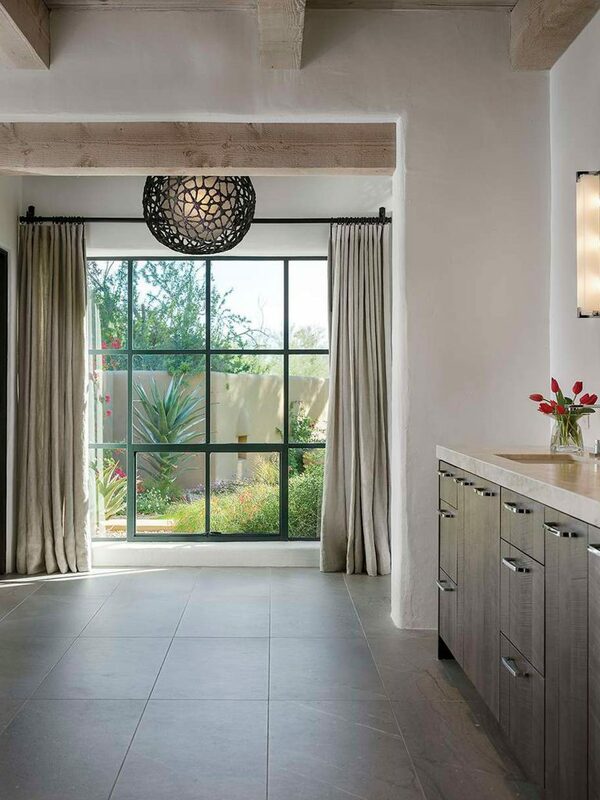 The open contemporary kitchen better suits the homeowners’ needs. 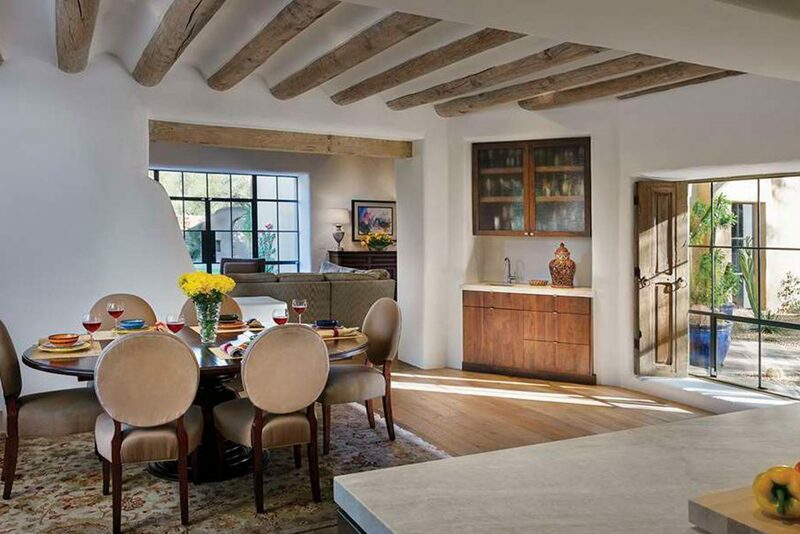 The thoughtful renovation of an aging Pueblo-style home preserves its architectural integrity. Homeowners Margaret and Ken Barnes had long desired to move from Chicago to the West when they retired, but they weren’t quite sure exactly where they’d land. They looked at houses in California, where they had once lived; in Colorado, where a son resides; and in Arizona, where Ken spent time as a child. 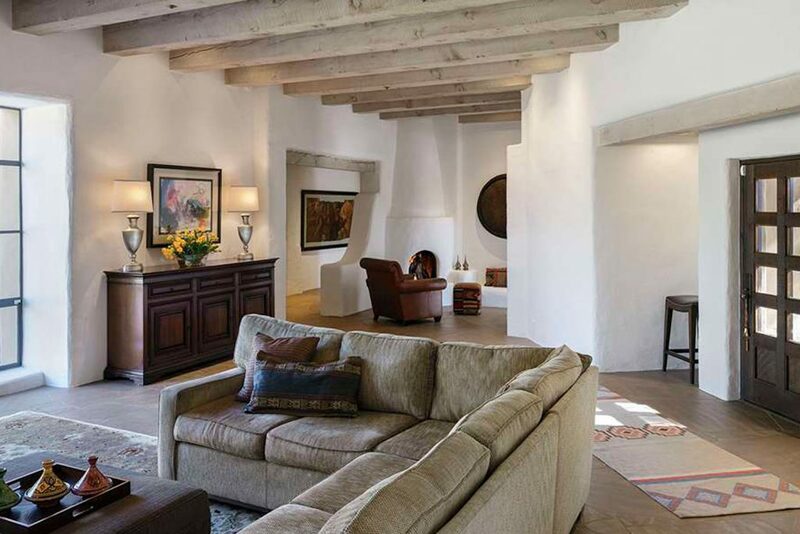 When a realtor showed them an adobe residence designed and once occupied by the late Arizona artist and architectural designer Bill Tull, they knew their search was over. 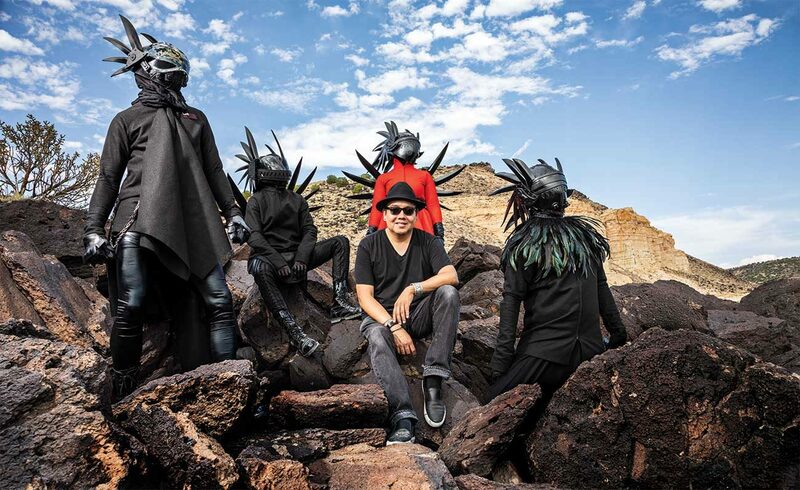 While the Tull-designed adobe captured the couple’s hearts, there were a few things they wanted to change. Originally built in 1976 and remodeled over the years by previous owners, the house needed a number of updates to better suit Margaret and Ken’s needs. For example, the kitchen was small, and its layout didn’t function well for modern-day use; the master wing was too compartmentalized; and all the bathrooms were dated and dark, the homeowners recall. So they decided to modernize it and make it their own. 1. 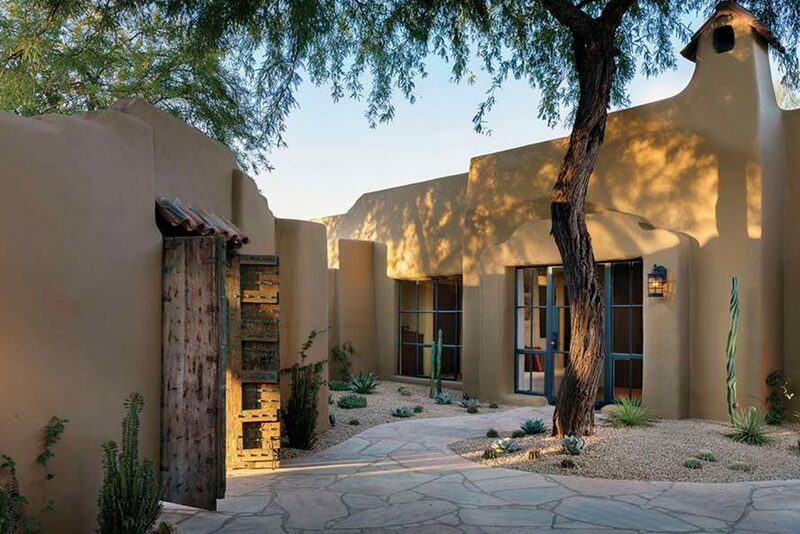 Boulders and desert plantings line the walkway leading to the tree-shrouded entry and expansive front courtyard. 2. The dining room’s scalloped beamed ceiling is original to the house. Once closed off, the space now opens to the new contemporary kitchen and an ample living room. 3. Once stained a dark brown hue, ceiling beams in the living room were sandblasted to make them blend with the lighter wood and white walls now found in other areas of the home. Furnishings here and throughout were repurposed from the couple’s Chicago home and placed with Carson’s guidance. 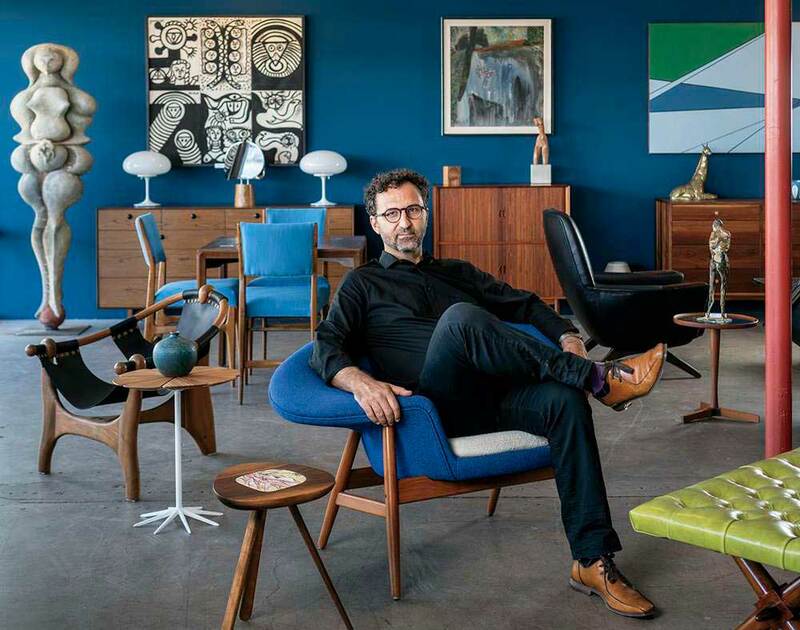 Enter architect Andrew Carson, whose involvement in the remodel was a matter of serendipity. It seems he had drawn plans for another client who had expressed interest in the house but had never moved forward, and the Barneses discovered them—detailed on three foam boards and left in a closet—when they were considering purchasing the home. “We realized they were for this house, found Andrew’s name and contact info on them, and decided to give him a call,” recalls Ken. An extensive redo incorporating some of the changes detailed on those plans as well as additional upgrades was soon underway. “The homeowners really liked what we were starting to do on the early plans, but they wanted to take it even further,” says the architect. 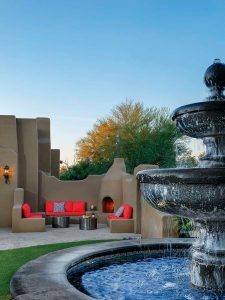 Having previously remodeled three other Tull homes, Carson was familiar with the architectural designer’s style and signature elements, including ceilings accented with vigas and latillas, sculptural fireplaces, stepped walls and rounded corners. He notes that this particular home had been added onto randomly in previous years—and in a way that was not in keeping with its original design. In addition to eliminating what he describes as a “Mr. Potato Head addition” off the kitchen, Carson removed the existing master wing, which comprised a bedroom, two bathrooms, an exercise room and a small office, and replaced it with a simpler, more functional suite. “The entire area had been added on in pieces over time; it was like a mouse maze,” he says. “We reimagined the space to keep it simple, warm and relaxing. 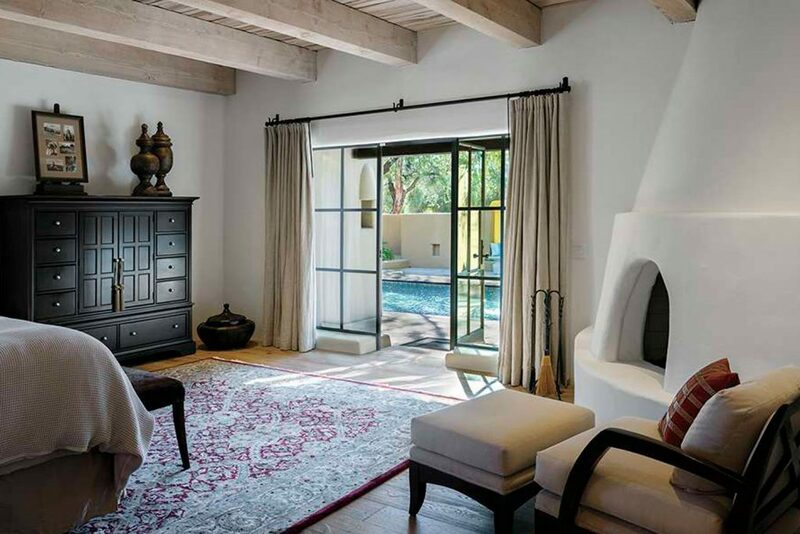 Now it relates much more to the original architecture.” The new open master suite includes a bedroom with a sitting area, a laundry room and an expansive bathroom with oversized windows that look out to the gardens and Phoenix Mountains Preserve. Other changes included removing a large fireplace outside the kitchen that blocked views of the pool and courtyard, creating an owner’s entry off the garage, relocating the laundry room from this area to the new master suite, and tucking a wine room into an alcove at the rear of the living room. As the renovation progressed, Margaret and Ken decided to gut the existing kitchen and open it to the adjacent dining area. While the original space featured signature Tullian tile countertops and painted cabinets with tin fronts, the couple wanted a more contemporary feel, complete with modern amenities. The revamped space boasts a center island, rift-cut wire-brushed walnut cabinets, natural quartz countertops with a leather finish, and stainless steel appliances. Carson added a pair of windows that flank the range hood and allow natural sunlight to flood the cooking area. 1. A large window wall with a view of the front courtyard was added during the remodel. Situated off the kitchen, it provides abundant natural light, fresh air and lovely views. 2. Houses created by architectural designer Bill Tull, as this one was in 1976, were known for having small, enclosed kitchens. Opening the space and adding stainless steel appliances and a center island greatly improved the room’s functionality. 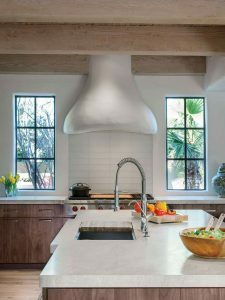 A pair of new windows, designed by Carson to match the home’s original panes, flank the plaster range hood and let in natural light. 3. This cozy sitting area with a kiva fireplace and a banco is situated at one end of the living room. 4. The warmth of a fire and the sound of water spilling into the circular basin of a tiered Canterra fountain can be enjoyed from the home’s winter patio. Brightly colored cushions enliven the banco seating area. 5. Porcelain tile clads the floor of the new elegantly simple master bath. Plaster walls have rounded corners—a design detail found throughout on both new and existing walls. A large window looks out to the gardens beyond. In addition to being brighter, the house now boasts a significantly better flow, while new windows that match the original ones offer improved views of the surrounding landscape as well as Camelback Mountain and Phoenix Mountains Preserve. “Because of all the big windows, the light and shadows change throughout the day, and the courtyard and mountain views make you feel like you’re outside even when you’re inside,” says Ken. 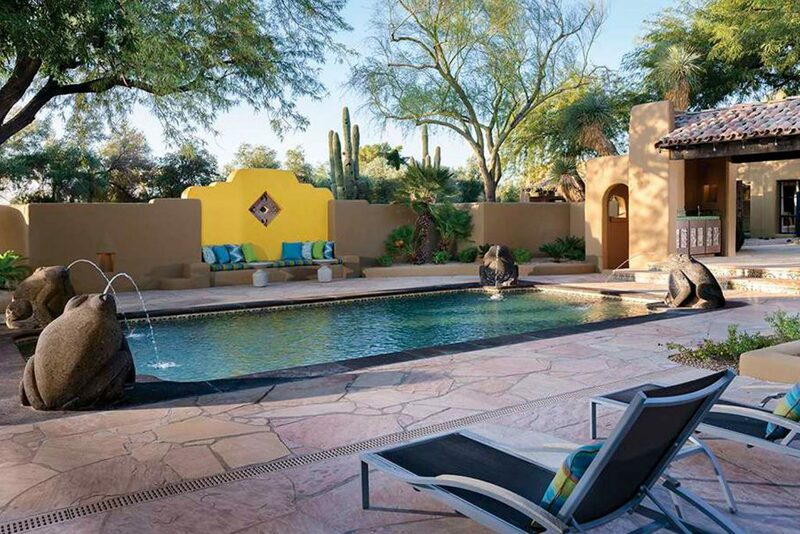 In keeping with the property’s natural surroundings, many of the large boulders that dotted the yard were retained, and Rockwell added a variety of new cacti, agave and succulents for color, texture and graphic appeal. Now the gardens overflow with desert-friendly flora, including towering totem pole and organ pipe cacti, Indian fig and beavertail prickly pear, spiky Parryi truncata and Agave Americana and augustifolia, vivid Euphorbia tirucalli ‘Sticks on Fire,’ lush Moroccan mound and Seussian Hercules aloe. “The Barneses are full-time residents and wanted a house that would be a good Arizona experience,” Carson says. “They fell in love with this property the way it was, and we didn’t want to take away anything that would change the way it feels. I think the editing we did helped us get back to the home’s original architectural integrity.” The thoughtful renovation preserved the home’s beauty—strengthening its heart without destroying its soul. 1. 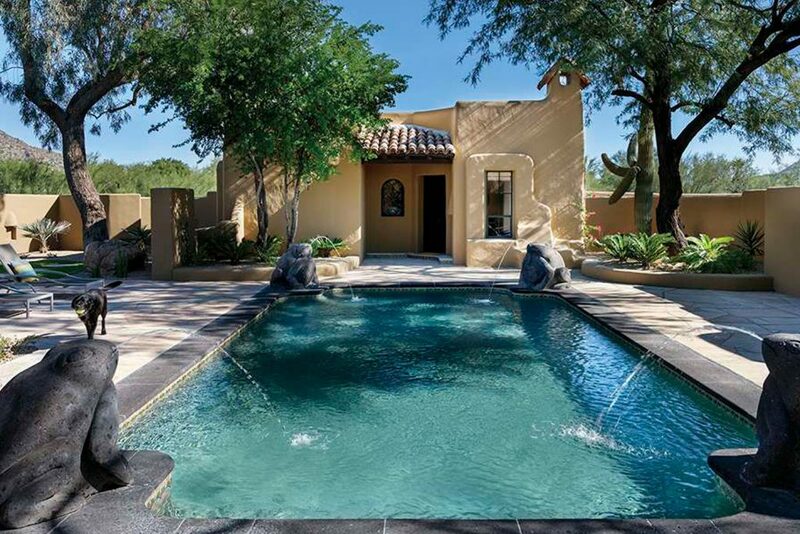 The centerpiece of the front courtyard is a large rectangular pool accented with Canterra frog fountains. The detached guesthouse was also renovated by Carson. 2. When designing the gardens, landscape architect Michael Rockwell retained the many mature trees on the property, including this one that shades the spacious entry courtyard. 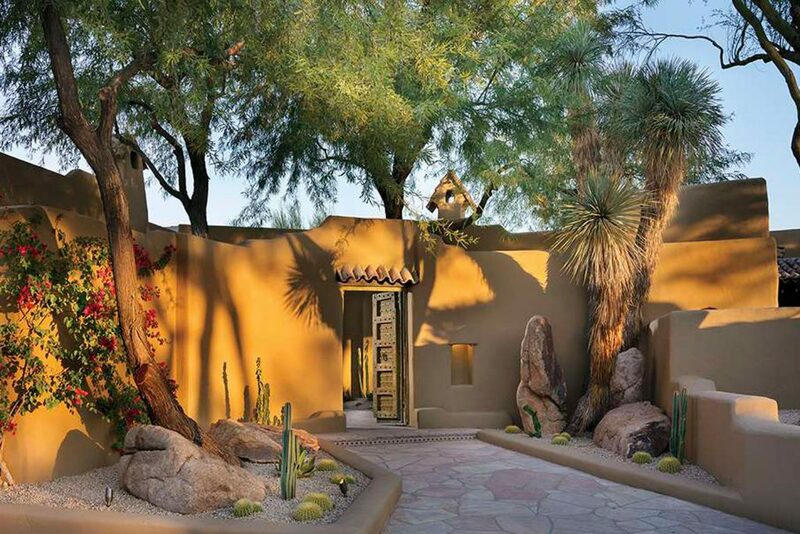 He added a variety of desert-loving cacti, agaves and succulents, which complement the adobe architecture. 3. The master wing, which comprised numerous small rooms that lacked cohesion, was reimagined into a functional space that is open and relaxing. 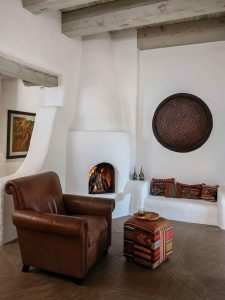 The kiva fireplace and wood plank-and-beam ceiling are consistent with details found in other areas of the house. 4. To the right of the pool is a covered breezeway that connects to the main living area of the house. The home’s original kitchen cabinets with punched-tin fronts were repurposed to an outdoor wet bar in the breezeway. The bright yellow scalloped segment of the courtyard wall features a banco with colorful cushions and an inset decorative tile accent.